Mystcraft is a mod inspired by the Myst game series. It allows Players to create and travel to dimensions called Ages, as well as the vanilla dimensions included in the game. Players do this by creating Linking Books. In the Mystcraft versions 0.10 and newer, the way of creating Ages has been greatly modified and improved . Mystcraft adds a liquid, Ink which is crafted in Ink Vials, and many other items and symbols. The Getting Started tutorial should help a Player on the creation of Mystcraft Ages. A Photo Taken with ExtrabiomesXL, biomes in a Mystcraft world. Linking Book (rare): sometimes the whole inventory is deleted when changing dimensions. The inventory can sometimes be deleted time after time when entering a dimension for the first time. 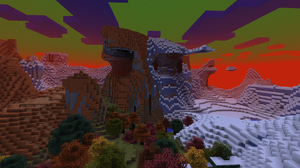 Some versions of Mystcraft will leak RAM memory and can have block-update lag. Although, this is sometimes fixed and may happen randomly instead of happening every time the game is started. Older versions of Mystcraft (1.6.4, 1.7.10) are prone to these symptoms. Also, older Ages that have been used for a while are more likely to start leaking RAM. The game may occasionally crash when making an Age and not be able start up the world again without resetting the Player's position in the world. This bug also happens on servers and will crash the server. ↑ Mystcraft version 0.10.x and newer, will make most of the old Mystcraft Ages unstable to at least have a bad effect. So be warned. The Player can use the /myst-agebook [dimID] command to give a new copy of the old Age book. It seems the reason for unstable old Ages might just be that the biome controller comes before the biome list. This page was last modified on 24 January 2019, at 07:08.